Top Rated Questions about Labels? Browse our product range by selecting a category from menu on the left hand side of the page or alternatively use the search function, in the top right hand corner of the page. When you have found the product you would like to purchase, choose an option from the Select material colour and adhesive type drop down menu. The option prices will be displayed next to the option name. Enter the desired amount in the Quantity box and click Add To Cart. Please note that a quantity of 1 in the shopping cart, translates to 1 box of 100 sheets. For example, if you require 400 sheets, enter a quantity of 4. The selected product will then be added to the shopping cart. If you need to browse the shop for other products to add to the order, the shopping cart will store the added item(s) until you need to make a purchase. Products can be added and deleted at any stage whilst you are in the shopping cart. If you would like to adjust the quantity of an item, change the number in the Quantity box and then click Update. The shopping cart will then recalculate the order amount. When you are ready to make a purchase, click Checkout. The invoice location is set to a default of United Kingdom. You can select whether you would like to have your order delivered to a different location from your billing address by ticking the box in the Select Shipping Destination section. Select Next to continue. After you have filled in your invoice address and delivery address, if different, select Next to continue to the payment pages. Your browser will then re-direct you to the secure online payment system provided by Protx. You can securely enter your credit/debit card details and pay for your order online. If payment is successful, you will be re-directed back to the Order Receipt page, which acts as confirmation of your order. You will receive an order confirmation email and payment confirmation email from Protx. If you do not receive either of these emails, please contact us, quoting your name and order details. Yes all of our label and print prices include volume related price breaks, which means that the more you order the lower the unitary price and the greater the value for money of your purchase. The price breaks will display each time that you enter a sheet or roll quantity, enabling you to see the next volume discount. 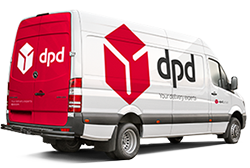 If you would prefer to place an order via the telephone you can do so by calling 01733 588390 between the hours of 08:30 to 17:30 Monday to Friday and a member of our Customer Care team will assist you. Can I get advice about my label requirements? If you would like assistance with the choice of face-stock materials, adhesive and release liner most appropriate for your intended label application, then please contact our Customer Care team on 01733 588390 who will be pleased to help you. This service is available between the hours of 08:30 to 17:30 Monday to Friday. We accept VISA, MasterCard, Delta, Switch/Maestro, Solo, VISA Debit and VISA Electron. All payment card information is processed using a secure payment system provided by PayPal. PayPal is now integrated as a payment method with Protx, one of the largest payment service providers in the UK; providing secure online payment solutions to thousands of online and mail-order businesses. Our complete checkout system is hosted on a secure server and when making payment a padlock symbol will appear at the bottom of your browser window to confirm that you have entered a secure area. PayPal uses enhanced security protocols called 3DS for safe online purchases. 3D-Secure is the secure protocol designed to ensure enhanced security and strong authentication for you when you use your debit or credit cards for online purchases. It is called, depending on the card type, “MasterCard SecureCode”, “Verified by Visa” when you transact, you may be asked to provide a special security code to the card issuing bank in order for the bank to authorise the online transaction when prompted in the PayPal payments page. Card issuing banks have different methods of generating and delivering these codes and so if you don’t know your 3D-Secure pass-code or password, then you will need to contact your bank. What is the most popular material for self-adhesive labels? This varies and is largely dependant upon the label application and finished format. For example address labels, packaging labels and shipping labels in sheet and roll formats are normally produced on a matt-white paper with a permanent adhesive, although occasional and seasonal address labels are popular on luxury paper face-stocks and often with pre-printed designs included. 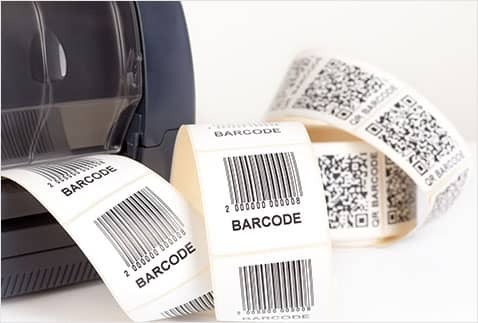 Paper labels for product labelling and/or promotional purposes that display some of the background face-stock are usually on a semi-gloss, or high gloss paper or film, such as polypropylene in both sheet and roll formats. High visibility labels in industrial and warehouse applications e.g. Bin location and pallet labels, are often in fluorescent films to resist abrasion and wear. Labels that require to resist extreme temperatures or weather conditions, require specialist adhesives and finishes for protection. The list of considerations is extensive and this is why our Customer Care team will always enquire first about the label application to provide the best advice on materials and adhesives. I have specific label size requirements and I cannot find suitable labels within your standard range. Can you supply labels to my exact specifications? Yes we can produce labels to your exact dimensions and shape requirements. Please complete our custom labels enquiry form and a member of our Customer Care team will contact you. 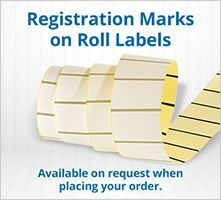 Do You Supply Labels on a Roll? We produce both plain and printed labels in roll formats on a variety of paper face-stocks suitable for direct thermal and thermal transfer printing, in a range of colours and both clear and white films. Printed roll labels can be produced in monochrome and full colour up to 8 colour process including specialist foils e.g. gold and silver and a number of gloss and matt finishes. Yes at AA Labels we can provide you with up to 3 different A4 sample sheets of label materials. We cannot promise that the samples sent will be the template you require, but you will still be able to access the suitability and undertake a test print. Please complete the samples request from the “Contact us/Sample request” page found under the “SERVICES” heading at the bottom of the page, or call our Customer Care team on 01733 588390 to order your free samples. Can You Provide A Free Sample Of A Particular Label Material? Yes at AA Labels we can provide you with up to 3 A4 sample sheets of a specific label material. We cannot promise that the sample sent will be the template you require, but you will still be able to access the suitability and undertake a test print. Please complete the samples request from the “Contact us/Sample request” page found under the “SERVICES” heading at the bottom of the page, or call our Customer Care team on 01733 588390 to order your free samples. Top Rated Questions about Ordering? Products can be added and deleted at any stage whilst you are in the shopping cart. If you would like to adjust the quantity of an item, change the number in the Quantity box and then click Update. The shopping cart will then recalculate the order amount. When you are ready to make a purchase, click Checkout. 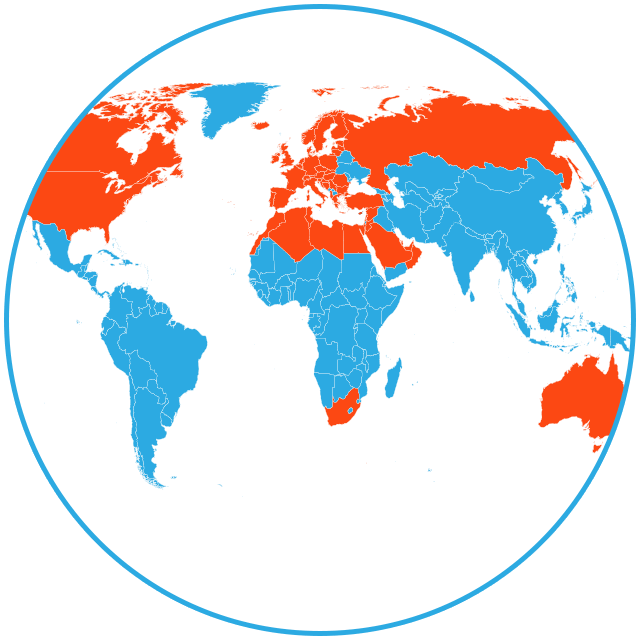 The invoice location is set to a default of United Kingdom. 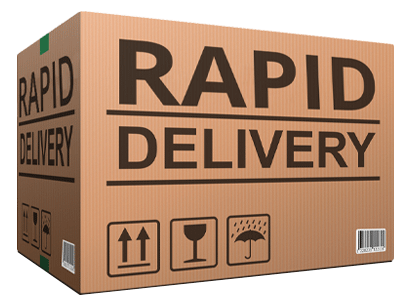 You can select whether you would like to have your order delivered to a different location from your billing address by ticking the box in the Select Shipping Destination section. Select Next to continue. After you have filled in your invoice address and delivery address, if different, select Next to continue to the payment pages. Your browser will then re-direct you to the secure online payment system provided by Protx. You can securely enter your credit/debit card details and pay for your order online. If payment is successful, you will be re-directed back to the Order Receipt page, which acts as confirmation of your order. You will receive an order confirmation email and payment confirmation email from Protx. If you do not receive either of these emails, please contact us, quoting your name and order details. If you would like to place an order over the phone, our sales line is open from 8:30am – 5pm, Monday to Friday. All credit card information is processed using a secure payment system provided by Protx, a leading online payment processor. Our complete Checkout system is hosted on a secure server. A padlock symbol will appear at bottom of your browser window to confirm that you have entered a secure area. Yes. 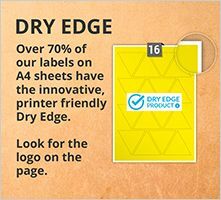 AA Labels can provide you a free sample of a specific label material but it's tricky to supply individual label templates since we make most of our orders to order. Please contact the AA Labels Helpdesk to order your free samples on 01733 588390 . Can I Order Free Samples? We're more than happy to provide up to 3 free material sheets of your choice of label colour, material or adhesive. Please click here to order your free samples. How Do I Create An AA Labels Account? You can create a new account in following two ways. Point your cursor to the "Sign in" tab on the top of the right side module. It will slide down and you could see a link "New users register here" right below the "Sign in" button. Click this link. You will be directed to the account creation page. Fill out the form here following the instructions. After adding all of your labels to the cart, go to the checkout page. Here you will see a form under the 'Your Details' heading right below the details of your order. Fill out this form and make sure the 'Create new account' checkbox is checked.After making sure you have provided all the required details and reading our terms and conditions, click the 'Confirm and Pay' button in the bottom right of the page. Your account will then be created and the next time you visit the AA Labels website you will only have to provide your email and password to sign in. If you have forgotten the password of your AA Labels account, click the 'Forgotten Your Password' link below the 'Sign in' button. You'll be asked to provide your email address. Your password will then be sent to you on the same email address. Do You Offer Bulk Labels Discounts? Yes. We offer bulk discounts of 65% for orders of 200+ boxes of labels. For details click the 'Bulk Discounts 75+' tab above the labels price on the product page. Unless otherwise agreed by us, payment for all goods must be made in advance in cleared funds or by credit or debit card. Credit terms of up to 30 days may be available from us which we will be happy to discuss separately. You can find the full payment terms under 'Price and Payment' heading in our terms and conditions. The minimum order quantity is one box of A4 sheets of AA labels. Top Rated Questions about Pricing? Is VAT Included In The Price Of Labels? Yes. VAT is included in the prices of all the labels or services at AA Labels. You will receive an order confirmation as soon as you place your order. You will then receive a dispatch email when your order is completed. Attached to this email will be a pdf invoice for your records. BACS payments are an accepted payment option and we will provide a pro-forma invoice against which payment should be made. However we are unable to process your order for production and artwork approval if required, until the payment has been cleared by our bank. Payments via PayPal accounts are an accepted payment option and we will provide a pro-forma invoice against which payment should be made. However we are unable to process your order for production and artwork approval if required, until the payment by e-cheque has been cleared by our bank. Can I pay by PO? Purchase orders as confirmation of payment are only accepted from the educational sector e.g. Academies, schools, colleges and universities, along with government bodies e.g. Local, regional and national departments and the MOD. Payment is required within 30 days from the date of invoice. How will my labels be packed and despatched? We currently pack A4 sheet labels in quantities of 25, 100 and 250 sheets. Dependant upon the quantity of sheets ordered we may also use an outer box and in the case of larger volumes the labels will be palletised. A3 and SRA3 sheets are packed in quantities of 100 sheets in loose leaf format within boxes and roll labels are also boxed for delivery. What is the most common and standard material for self adhesive labels? Standard matt white paper is widely used for inkjet, laser and flexo printing. It provides an excellent multi purpose printing surface, a high quality finish and long shelf life. Yes, we can supply custom labels to your exact specifications. Please fill in our custom labels quotation form and we will contact you by email or telephone within 24 hours with a quote. Yes we do supply Labels on roll. Yes. AA Labels can provide up to 3 samples of specific label materials. We can't promise to provide the exact labels template with our free samples but we can certainly send you up to 3 free material samples so you can test them out on your laser or inkjet printer or photocopier . 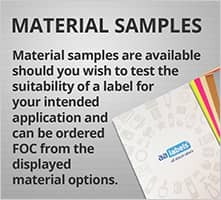 Please contact the AA Labels Helpdesk on 01733 588390 or simply choose the material samples and email us on this page, and we'll pop them in the post today. Top Rated Questions about Sheets? How many sheets per box? We don't do boxes as such everything is priced per the sheet Min order is 25 sheets but you can order as many sheets as you like. We provide a calculator on each product page where you can input how many sheets you want and it will tell you the price ex vat. 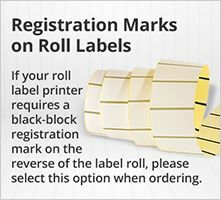 Top Rated Questions about Roll Labels? Is there a minimum quantity of labels required? 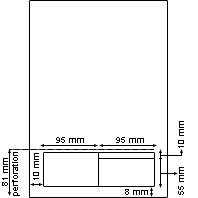 The die-cutter for roll labels will vary by size e.g. Smaller label sizes might be produced 10 rolls per press-run and larger label sizes less rolls per press-run. The number of rolls to be produced will be shown against the label size being considered and generally speaking the smaller the label dimensions the higher the number of labels to be ordered should be for purpose of cost effectiveness. How will my labels be orientated on the roll? There are two ways in which your labels can present from a roll which on the outside (wound out) or inside of the roll (wound In) and a number of factors influence the choice of having label on the outside or inside of the roll including label size and surface, adhesive type and means of application. Irrespective of whether your labels are on the outside or inside of the roll there are four ways in which the label can be orientated for mechanical application and often personal preference in manual application processes. What is the core size? The core size refers to the diameter of the cardboard core around which the labels are wound and this can be an importnat measurement in machine applications and printers, so it is importatn to know the maximum and minimum core sizes taht are compatible. AA Labels provide a choice of four core size daimeters to choose from e.g. 25mm; 38mm; 44.5mm & 78mm. If no core size is specified labels will be produced on a 25mm diameter core. 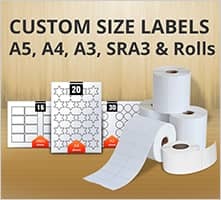 Can my roll labels be printed? We produce both plain and printed roll labels in monochrome or full process colour options including up to 8 colours and specialist finishes such as gold and silver foils.